The HA-1 Compression with built in a-Fit technology provides anatomically correct support and fit for the left and right foot. The HA-1 CompressionA's functional support and unique knitting technology stabilizes the heel in a neutral position, and lifts up the arch of the foot to prevent it from leaning inward. This will minimize the stress from repetitive impact on the foot to reduce plantar fasciitis. Note:- Measure the circumference of the calf and the ankle at their widest point. If your measurement falls between two sizes, choose the larger one. 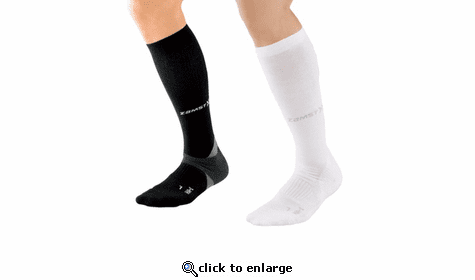 G-Fit: Gradient compression construction improves blood flow, increases oxygenation and enhances performance.